We were informed that construction of the cylinder pattern was expected to be completed by the end of January. The driving wheel pattern has also been completed and we are seeking quotes for the casting process. An order has been placed for casting the centre cradle of the rear pony truck. 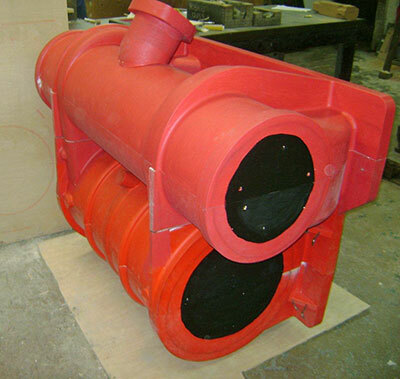 We are very grateful to the Standard class 2 Project at The Bluebell Railway who have done all the spadework on this component and allowed us to have a casting done for us from their pattern at the same time as casting their own centre cradle. All of the cold rivets are now installed in the stretcher in front of the smokebox saddle. The stretcher behind the smokebox saddle is ready for riveting together with the motion brackets and vertical stretcher. The brake shaft brackets have been machined and material is being obtained for making the axlebox guides for the pony trucks. We have a new addition to our range for 2013 in the shape of a smart backpack. The bag, which may be seen on our sales page is available in black with our logo embroidered on the front and costs just £25.00 including post and packing. This continues to make encouraging progress. Since the last report, member Peter Kirby has very kindly sponsored the pony truck axlebox guides - unobtrusive but extremely important components of the front and rear pony truck assemblies, work on which is under way in tandem with the expected casting of the driving wheels in the first half of the year. Very many thanks, Peter. Also sponsored is one of the two anti-vacuum (snifting) valves, thanks to the wife of a supporter who suggested to friends that a certain milestone birthday might best be marked by having a collection in aid of 82045. The person concerned wishes to remain anonymous, though it is clear that she is married to a chap who knows how to treat a lady: after all, not many women get a snifting valve for their birthday, as he recently remarked to me! In the wake of the very successful cylinder appeal (approx 25% of which was contributed by the proceeds of the 2011 SVRA Raffle; many thanks to all concerned), this particular pot is being kept open to receive funding for the engine's motion. As you will know, we acquired the forgings for the connecting rods in the autumn, and are now raising money for the remaining motion components alongside the ongoing wheel appeal. We understand that the A1 people paid approx £20,000 for Tornado's four coupling rods, which has provided us with a useful yardstick with which to estimate the cost of our own, as well as that of the smaller rods (eccentric, radius, combination lever, union link) and other constituents of the Walschaert's valve gear. Further details will be published in the 82045 monthly updates under Sponsorship, in the meantime have a word with Chris if you are interested in contributing. Once the wheels and motion are secured, we can then pull out all the stops and go for the boiler. Thanks in anticipation! 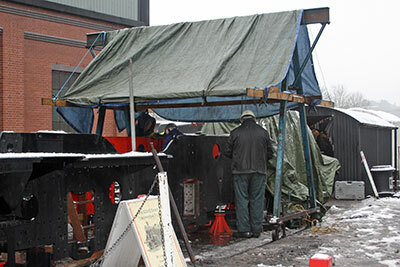 Two photos, the first taken by Steve Meech of Cerdic Foundries Ltd. just before Christmas shows the cylinder pattern. The second photo shows the "all weathers division" of the 82045 construction team at work in the snow of 14th, January. Unfortunately the snow on 21st was too much and the working party was cancelled for the day.